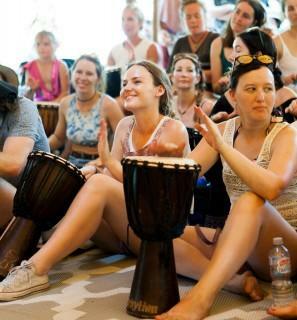 Watch this group of 80 lawyers from Allen and Overy drum it up and get in rhythm at their well earned corporate retreat in Bali. The global team consisted of staff from offices in countries like Singapore, Indonesia, Australia, New Zealand and more. Activities included InRhythm's world-class body percussion, boomwhackers and famous interactive drumming. Apart from having a lot of fun, the team, the team building drumming showed the keys to successful teamwork, leadership and effective communication. The team chose our team building ideas which ran for half a day including 3 sessions.